Have you seen a drone light show recently? Perhaps you have seen a picture or video of one, but I imagine you most likely have not seen one in real life, they are amaizng! According to TIME Magazine, we are living in The Drone Age. If you have seen some of Intel’s biggest drone light show performances on TV or YouTube, you may wonder why we aren’t seeing these more often. It’s really freaking hard to do and it’s really expensive. This might seem odd, considering you can buy a drone for under $100 on Amazon and fly it within minutes of opening the box. It should be easy to buy a few dozen more, pop a multi-colored light on each one, whip up some software to control them, and start building giant animations and images in the sky, right? The trickiest problem with this approach is not the drones or the lights, but the software. One person can easily buy a drone and find an app to automate it’s flight path if they are willing to do their research. However, add a few more drones to the mix, and the complexity increases tenfold. Even if you do manage to create automated flight paths for each drone in the swarm, how will you get them to start their flights at the same time? Are you going to use ten or twenty different computers or mobile phones and somehow press “fly” at the same time? I don’t think so. That sounds like a nightmare. It takes some special software, a bit of hope and lots of experts to make it happen,. Piece of cake. — NOT! Although this might seem confusing, plenty of smart engineers can figure it out. 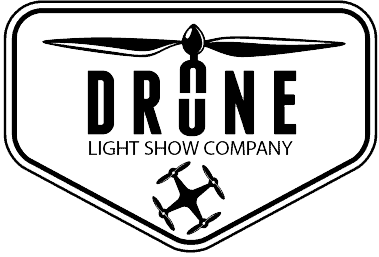 We have been doing custom drone shows for 5 years now. You can not just buy a drone show off the shefl. We have to build them from scratch and configure them oursleves, hundres and hundreds of drones must be done this way. Each of these drones cost around $1200 for the materials alone. Intel does drone light shows with their own custom drones, and an intel show runs from 500k and up for a single show! Lucky for you, we offer drone light shows from $12,000 and up. We build our own drones and have our own special softrware to boot. Intel drones are similar to ours, and ours are much cheaper pricewise, and we can move faster than a large company. As drone technology gets better, drones will become safer. In fact, drone technology is pretty great right now, and very safe. Human error is the biggest concern. As software and people get better at managing swarms of drones, event organizers will feel more secure about having these drones closer to their patrons. Right now, this is a big concern among event organizers. In fact, every event organizer we have talked to has brought up safety as their number one concern. What is the fly away protocol for a drone?
. For our drones we have secondary control channel on RC to take over it manually if it does not respond on commands from Show control console. It is very simple to take control of one drone or multiple and land them safely while the rest of the show moves forward. What happens when a drone doesn’t follow the programming? What is the planning process for each drone? Daily checklist? Each day drone batteries must be charged, propellers must be inspected to ensure they are in good solid working order, the logic board should be reset once a week. What is the Pre-Flight planning guide? Will this be included in the creation of the show? There is best practice to setup show with steps to follow to ensure mistakes are minimized and tech issues identified in timely manner, the steps will be clearly shown when we arrive in person for the set up. What is the weight and wind capacity? For wind does that include strong gusts or constant flow? Our shows are designed to can go to about 18-28m/s strong winds with gusts. Before show gets ugly. Are they controlled using radio channels? If so, which channels? Is there an “Emergency Stop” option? You know how a group of birds look when they fly together in formation? They look amazing, even in daylight, in fact this is called a murmuration. It almost looks like one solid shape flying through the sky. Now, imagine that each bird in this flock could shine any color. Imagine that you are able to control the color of each bird as well as the flock’s shape. You can move this flock into any shape you can imagine with an easy-to-use desktop application. That is what the future of this technology holds. Imagine the possibilities. Currently, drone light shows are being performed far away from the audience way up in the sky or off in the distance since each drone has to maintain a 2–3 meter distance between one another. I predict that drone light shows will take place directly above an audience, as part of a performance both indoors and outdoors. Drone light shows will be used in the same fashion that lasers and smoke machines are used during performances. Or, they may be the show that you pay to see. I also predict that drone light shows will be controlled in real-time. Instead of having to pre-program an entire show and upload the flight paths to each drone, I think operators will be able to control the whole swarm during the show on queue. This will make the drones look like an integral part of the show, not just a cool spectacle off in the distance. We hope this gives you a better idea of how to be ready for your drone event with us, we know it probably is your first time with drones and we want to make it simple, creative and fun for you to work with us.